You are here: Home / Business Skills for Artists / Why Should You Plan Your Projects in Advance? 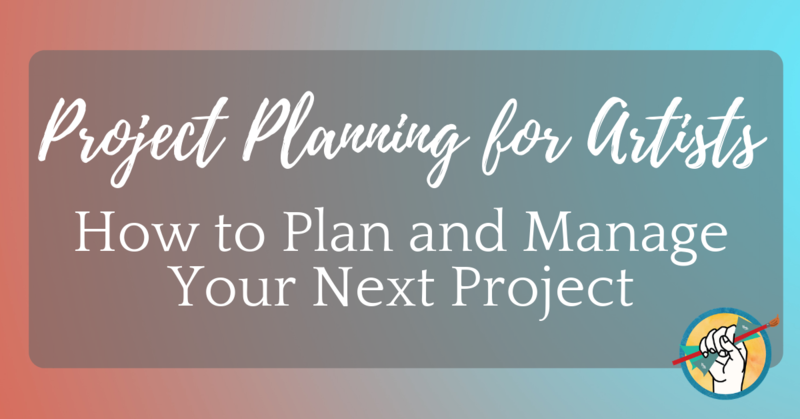 Why Should You Plan Your Projects in Advance? There’s an old adage that you can’t force creativity. And that may be true- but you can certainly coax it out with healthy habits and a framework that will enable you to succeed. Artists seeking to make a living from their work don’t have the luxury of waiting for the muse to speak. So how can you plan your projects in advance without stifling the creative spirit of your work? Project planning doesn’t have to look like paper planners and spreadsheets if those methods aren’t useful for you (if they ARE useful… have at it!) But planning out your work in advance- in whatever way works for you- will lead your current and potential clients to see you as professional and trustworthy. Some amount of planning is useful for keeping track of your artistic process so you can replicate it if you need. It’s also useful for identifying snags in your workflow that may be slowing you down unnecessarily. Finally, planning your projects in advance can make it much easier to track and record your progress, which is very useful for marketing. Fans of your work love to see work-in-progress posts! We’ve put together a list of ways you can incorporate some planning and organization into your projects- use these methods independently of one another, or combine them all and be a planning powerhouse! If you’re often working on projects that involve a lot of steps and documentation (perhaps as part of a grant or for a government entity) or you often work with others, give Dropbox Paper a try. You can use their project planning template to assign tasks, add annotations to documents or images, and connect it to your calendar. Dropbox is a file-sharing platform that is very familiar and easy to use to share files even if the recipient doesn’t have a Dropbox account, so this is a logical next step and a great way to make yourself look just a little more professional. The ability to assign tasks with due dates and tag specific project participants makes Paper a really useful extension of Dropbox. I can see it being useful for artists who do frequent commission work with some level of back-and-forth with their commissioners, or for artists who do a lot of collaboration work. The ability to add annotations to an image means you can upload a sketch and your commissioner can comment directly on the part of the image they want changed. If you can’t speak to them in person, this might be the next best thing. This method is best for: Artists who often work collaboratively, either with commissioners/clients or on group projects with other artists. It’s a great tool for increasing your professionalism and keeping everything well organized and documented! One easy way to implement some strategic planning into your workflow is to plan in advance to document your progress. Do you like to journal about your process? Take copious work-in-progress photos? Even video blog about what you’re doing? Set up your journal, your camera, or your video camera in your work space ahead of time, and set a timer on your phone to remind yourself to document what you’re doing while you’re in the thick of it. You’ll be glad to be able to look back on the various stages of the process, and now you have plenty of fodder for social media and blog posts! It’s also helpful to have images of your art at every stage of the process to present to potential clients. This method is best for: Artists who use social media to engage with their audience, and artists who keep a blog. So basically- this is a key step for just about any artist using the internet to promote their work. Accountability is a game-changer. When embarking on a new project, do yourself a favor and set yourself up with some method of accountability from the very beginning. Different people prefer different methods of accountability. Some like to announce every new project on social media and expect their online friends to check up on their progress, or at the very least, use the potential embarrassment of not following through as motivation to push through and finish the project. Others prefer a more structured (and private) approach such as a mastermind group. You can join an existing mastermind group, or start your own. Within a well-structured group, you can expect regular check-ins to report on your progress and receive feedback and encouragement from other artists working towards similar goals. Check out our conversation with The Abundant Artist mastermind facilitator Sarah Guthrie for some helpful tips on either joining an existing group, or starting your own. This method is best for: Artists who are serious about being held to their commitments and growing professionally. This method is best for: Artists who can make the commitment to a combination of weekly planning sessions and accountability meetings. Do you warm up before you begin creating art? An athlete wouldn’t dream of hitting the field without the requisite stretches, but it’s a factor that artists often overlook. As you plan for your next project, consider incorporating some time and space for a creative warm up. What that looks like will vary wildly from artist to artist; check out this helpful post on using a creative ritual to get your momentum going as a starting point. If you find that a warm up or “creative ritual” would be helpful for you, plan for it from the beginning of your project and incorporate it into your scheduled art-making time. This method is best for: Anyone can benefit from warming up before getting started. Planning it out beforehand is optional, but you may find it’s easier to remember to do it if you include it on your to-do list! The stereotype of the scatterbrained artist doesn’t have to be reality. Thanks to the internet, there is an easily-accessible abundance of software, apps, and programs designed to help you succeed in planning your next project. So whether you’re using an online application like Dropbox Paper or just keeping track of your progress on pencil and paper, there’s no reason not to take a step toward better planning. Not only will it make your life easier, but it will make you look more professional to your clients and audience. Are you a planning pro or are you flying by the seat of your pants? Share your own project planning tips in the comments! Want more on productivity for artists? And I agree: the 12WY methodology is applicable to anyone. It’s all about setting good goals and then doing the work. It doesn’t matter if they’re applicable to being a physician like some of mine, or being an artist.